Lillehammer, Norway – Rosie Brennan paced nervously alongside the Olympic ski tracks in Lillehammer as start time approached, staying close to the technicians working to prepare the best classic skis they could for her from their tiny wax cabin. It was a long way from the trails of White Pine Touring in Park City, Utah, where she grew up racing, dreaming of that day when she would be in the spotlight like her heroes Marit Bjoergen and Kikkan Randall. Alongside her were three teammates, all scrambling in the lead-up to the women’s 4x5k relay. There was a time a decade and more ago when the U.S. Cross Country Ski Team was a mere participant in the relay. Today, that team is a contender. The relay is the toughest event in cross country ski racing. It requires four athletes to perform on the same day at their highest level – there’s no margin for error. Each athlete has a role and has to execute. It was Rosie Brennan and Sadie Bjornsen’s job in the two opening classic legs to remain in contact with the pack, keeping a reasonable distance back from the second and third place teams. Next up would be Liz Stephen for the first skating leg. Now it would get intense. The Americans have one of the best closers in the world with World Champion Jessie Diggins. It was Liz’ job to set Jessie up for the kill. That morning, the girls went through their ritual face painting and glitter. They pulled on their brightly colored relay leggings over their racing socks. They came together as a team, marching into the stadium ready for battle. Conditions were nasty with the course freezing as solid as an ice rink overnight. It presented challenges for the wax team and fear for the athletes on the highly technical downhills. As the gun sounded, Brennan charged out of the start. It was a battle for 5k’s as she fought to stay in contact, holding off the Russians and coming in seventh, tagging Bjornsen who went on to ski the fifth fastest leg. But the team was still in seventh – a minute out of third place. An uphill battle for Stephen and Diggins. But they were tenacious. 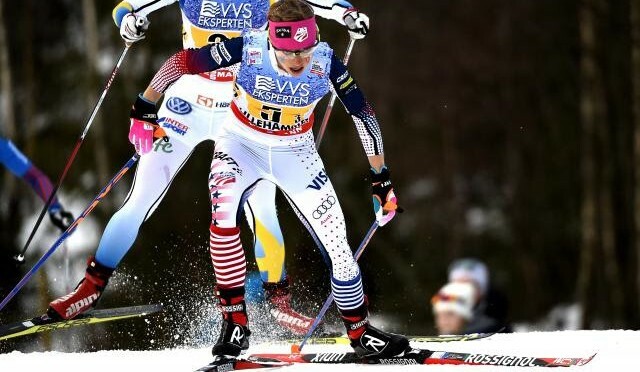 As the race went on, Brennan’s emotions were a rollercoaster – in part wishing she had been faster but soon seeing that she and Bjornsen had provided Stephen and Diggins with an opportunity. Two years ago she was on the sidelines in Lillehammer cheering the same girls on to third. Now it was her turn to be a part of the team. As Stephen took the pass from Bjornsen, the action began in earnest. Stephen had a tough task, but is also one of the best skaters on the team. As she headed out on her 5k leg, the USA was over a minute out of the podium. Thirteen minutes later, she passed off to Diggins only 21 seconds out of third. The next 13 minutes were legendary. One by one, Diggins picked off the contenders. It took just a kilometer to pass Sweden’s Charlotte Kalla and move into fourth. Next up was Ragnhild Haga and the Norway 2 team. That one didn’t come easily. But with just over a kilometer to go, Diggins moved past her into third. Stride for stride, the Norwegian matched her every move – waiting patiently to pounce back on Diggins. Harder and harder she skied, but Diggins could not shake Haga. As they came into the final climb just a hundred meters to the finish, Diggins charged like a bull up the steep. Haga could not keep pace and the Americans had their podium. As Diggins collapsed in the finish, Brennan, Bjornsen and Stephen ran to hug her, tears streaming over the face paint. For only the third time in history, the American women were on a relay podium. 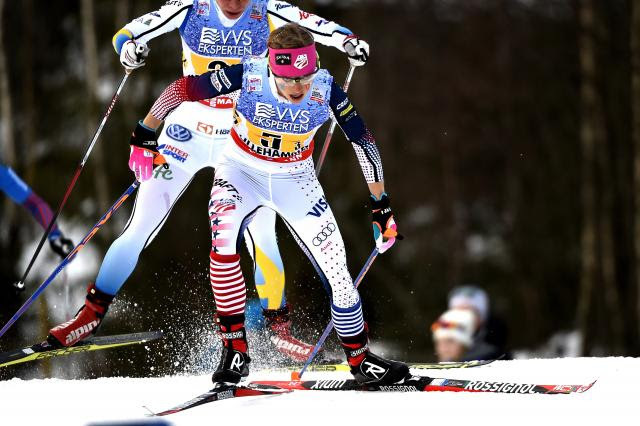 “Individual podiums are great,” said Diggins. “But getting to share a medal with a team is such a bigger deal for me because we work so hard all year round together and travel all winter as a family.